Free Sweet and Sour Recipe eBook! Like a Sweet and Sour Recipe Book? Like a mouth-watering sweet and sour recipe? 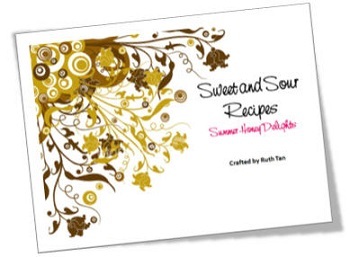 I'm proud to present to you my e-book "Sweet and Sour Recipes, Summer Honey Delights"! To have a clue about what this book is, read the "Forward" found in the book. Sweet and Sour Recipe eBook "Forward"
"This book is written out of a desire to share with others my passion-driven experience with honey; a super-food which I always find so amazingly healthy, intelligent and pleasant tasting. Comprising eleven exotic appetizers and desserts recipes using honey, it is a result of my 3-week-long research with an endless list of indigenous ingredients (peanuts, chillies, sesame, barley, pineapple, mangoes, papaya, black pepper, lime, pomelo, etc), fusing honey with some very colourful fruits and condiments from the temperate countries (like dried apricots, cranberries, and raisins) and playfully but painstakingly experimenting and discovering which foods together create the most unique, and most unforgettable magical union with the golden liquid. Living in a tropical place kind of deprive us of getting fruits such as peaches, nectarines, plums at a good price and keep us from good abundance of fresh berries and currants, strawberries, cherries, grapes, etc, but gratefully, we are compensated with the aplenty tropical fruits such as pineapple, mangoes, guava, bananas, and of course the ever-so-readily available honey! Living in a vibrant melting pot of cultures, a smorgasbord of American, European, Asian, etc, I see foods and condiments from all over the world colliding to evolve some of the most interesting and delightful concoctions for the taste buds. Amongst the diversities and complexities of cuisines, the exotic Asian aromatic tastes of sweetness, sourness, and spiciness all combined are what I am most drawn to. It's the hot weather I believe, that makes our taste buds constantly hankering for chillies, sugar, and lemons in the food we eat. I can testify to that after having had the opportunity to stay in the Netherlands for three months, and visited the country and its neighbouring European countries for about 15 times during the different seasons. All my time there, never had I cravings for a teeny weenie bit of citrus prune, but whenever I touched home ground, the gastronomic penchant for all the mouth-watering sweet, sour, and spicy foods would come crashing in again. Somehow, our tropical climate makes our brains somewhat tweak differently when it comes to foods. If you are from the tropical like me, you will love what I am going to share with you. And you will realise that the delectable flavours of sweet and sour do not have to come from preserved foods filled with health-hazardous saccharine, cyclamate, high fructose corn syrup, artificial colouring . They can be experienced from natural, wholesome and great tasting foods too! And if you are from the temperate countries, you are going to discover some of the most easily assimilated taste blends, yet the most epitomised, out-of-this-world sensations for the taste buds. Seek these ingredients out and put them together. You will be delighted! I'm not a culinary veteran, but a lover of foods that so cleverly use honey as a healthier sweetening alternative. And I believe a memorable food always contains a surprise element in it, for instance, one plate of fried rice can definitely taste better than another with exactly the same ingredients, for various reasons but the dish becomes memorable only if it has something else that others don't have, for instance again, fried rice with pomelo fruit in it! And this is what I aim for; to bring about a surprise in each of the recipes I create. Wishing every attempt of yours to dish out the concoctions will be a smash success and a real hit with whoever you are going to relish with!" Tell us your story about using honey to get this ebook FREE! If you like to have a copy of this sweet and sour recipe ebook (31 pages, PDF file, size: 1M), just share with us your experience with honey, for instance why and how you use it as part of your diet, how it has benefited your health, your family, which honey remedy or home facial mask or scrub you have tried and seen results, etc, etc, etc. We love to hear your sucess stories about using honey! Post Your Honey Experience Here. NOTE: Please note that we would only consider stories that have several sentences outlining and describing your experience with honey. Be as specific as possible. Thank you! I love stories that our honey enthusiasts send us and post. They are so inspiring and encouraging. Read what awesome and incredible things honey can do in our lives! All in "In what ways have you experienced the benefits of honey?" Alternatively, zoom straight into our most favourite posts in: "Experienced Benefits From Honey Before? Tell Us!" End of "Like a Sweet and Sour Recipe Book?" Back to "Mouthwatering Honey Recipes"